Our current line of decals are the result of over 10 years of experience, preparing custom decals for use on our own minis. Both Tony and Will are avid gamers, heavily involved in development efforts for Amarillo Design Bureau's Star Fleet Universe, and serious collectors of several different lines of minis. Will and Tony are also both frequent "kit-bashers" and modifiers of minis, which led to both of them also being sculptors for some of the Starline 2400 minis produced by ADB. All of that experience is poured into our Tenneshington decal products. 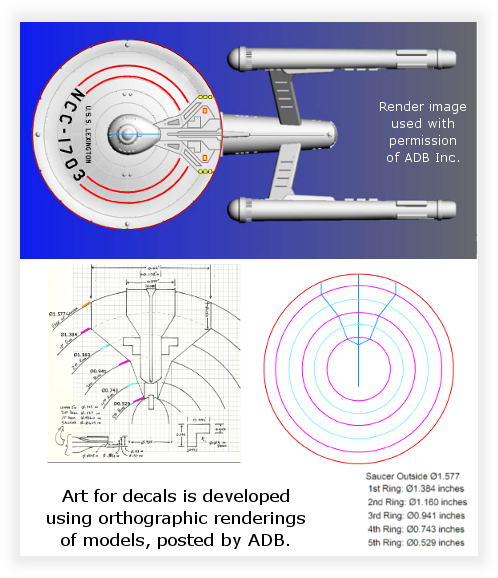 We know and love the Star Fleet Universe and we hope that passion for the material comes through in our decals. We developed the prototype versions of these decals for our own use (on some of the prototype miniatures) and we were then encouraged to make them available to everyone. Developing the master art for our decal sheets is a very involved process, involving multiple steps, often spread over many months. In the initial planning stages, we utilize the renderings of the 3D computer models that are posted by ADB. The renderings are brought into our drawing software, carefully scaled, and then used as the basis for our initial rough layout versions of the decal art. Wherever possible, we also use measurements of the physical miniatures for this initial planning. However, we are usually starting many months before the miniatures are available for purchase. To work around that delay, we often use pre-release measurements and sketches. This allows us an early start and a more-accurate starting point. As we progress with developing the decal art sets, there are occasions where we decide that they would benefit from having a 3D computer model (matching those built by Mongoose for the minis). 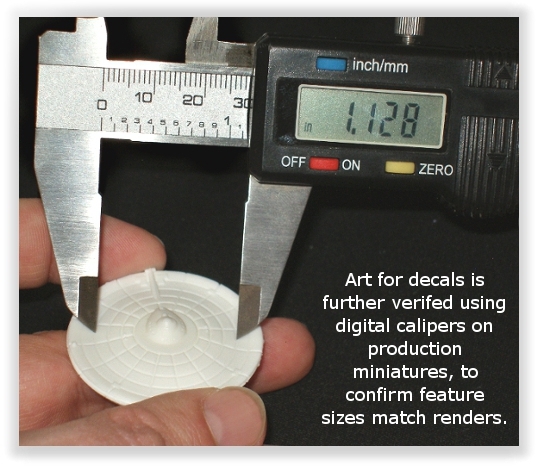 We can then utilize it to develop "flattened" versions of decal profiles that sit on surfaces with compound curvature. 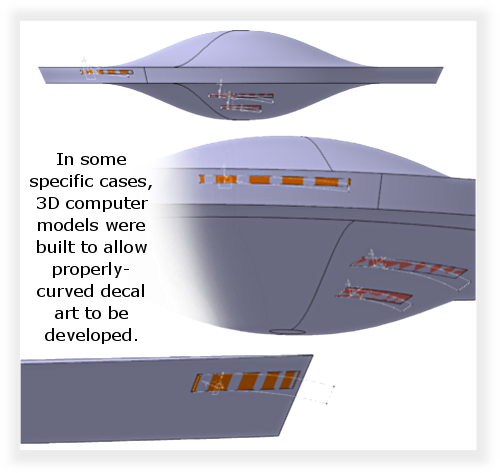 An example of the saucer of the Federation dreadnought saucer is above; This model was used to develop decals for the saucer-edge and lower-face windows that were omitted from the mini itself. We provide decals to emulate these windows. Due to our long experience, we have the correct, "accurate to TV" fonts available to us, along with reams of reference material (both SFU and TV/films) to refer to. 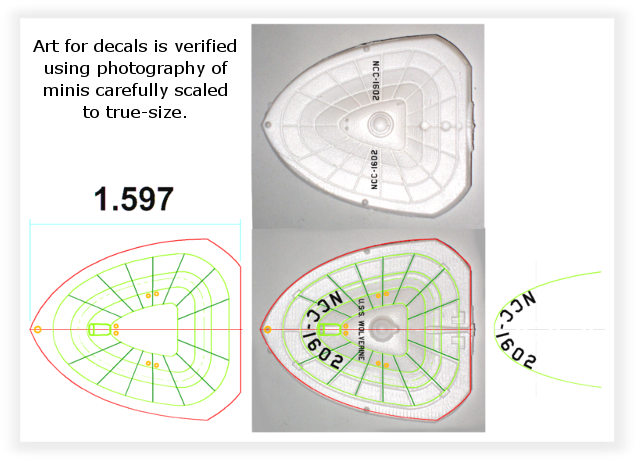 This helps us make highly-accurate decals and make informed decisions in the cases where we choose to make changes for usability, legibility, etc. Once we have production copies of the Starline 2500 miniatures in-hand, we can then begin the process of checking and finalizing the artwork. We use tools such as calipers, etc., to look for places where sizes and proportions on the miniatures may differ from the pre-production renderings. This is also where we can catch any errors we made in scaling the art. We are particularly concerned about things like the "NCC" numbers to go on top of Federation saucers. We take great care to make sure that these numbers will fit between two concentric "shield grid" rings, sitting completely on the "flat" surfaces between them. The final step for preparing our products is creating an arrangement that fits the most usable decal art on a printable sheet. We try to strike a balance between leaving lots of space between individual decal markings (to allow easy cutting and separation) and fitting the most sets on a printable sheet (to avoid wasting materials. It's inevitable that there will be some small portions of the sheets that end up unused. We use those open areas for bonus windows, hatches, etc. We consider this much better than just wasted blank space. Our decals are printed using a high-end color laser printer, using the best quality decal paper. We then seal them using an acrylic clear coat to protect the printed artwork. We use clear decal film paper, so there are no white outlines to worry about. However, please be aware that since we use clear film and our printing technology is laser-printer based, we cannot print white. Also please note that our decals are intended to work only on a light color background (white or light gray). They will not look their best on a dark background (dark gray, red, etc.). Again, this is because they are laser-printed on clear film, so there is no layer of white pigment underlying the graphics to provide a reflective surface (the way white paper or decals from factory-made plastic model kits would). We protect the printed decal sheets with zip-type plastic bags to prevent moisture intrusion and with a cardboard stiffener to avoid creasing. 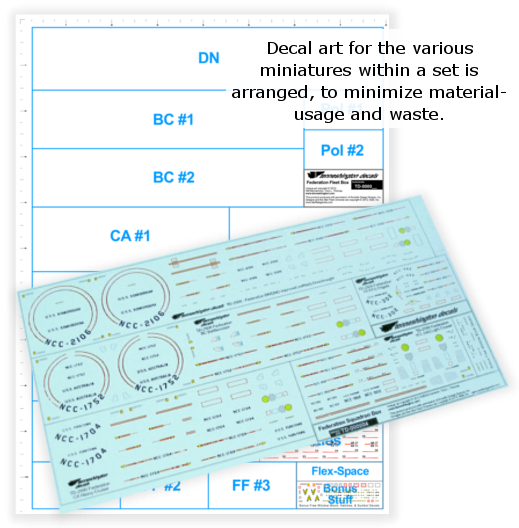 Any set of our decals includes fully-illustrated placement guides and detailed instructions to help walk you through the process of using our product.